Of course, as it is customary, the camera is not listed with a price tag but expect it to be in the range of 100k USD if you venture out to get one. It is still a great deal for labs, engineers and imaging studios but surely out of reach for most lone experimenters. The sample video shows a water balloon being struck by an arrow at 17,000fps at HD 720p resolution which is mind bendingly cool. 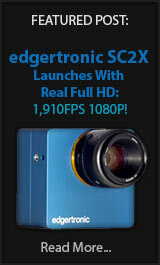 We will not list this camera on our guide as it exceeds the low cost threshold by a large margin. Introducing the Phantom v2640, the fastest 4Mpx camera on the market, with unparalleled image quality. As the newest member of the Phantom Ultrahigh Speed family, the v2640 achieves up to 26Gpx/sec, providing up to 6,600 fps at full resolution of 2048×1952 and 11,750 fps at 1920×1080. 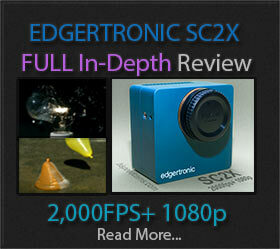 But there’s more – the v2640 has truly unparalleled image quality, and the numbers to prove it! It has the lowest noise floor of any Phantom camera (7.2e-) and the highest dynamic range of any Phantom Global Shutter camera (64dB) for the clearest, most detailed image, offered in 4Mpx resolution. Low noise is especially important in the dark, hard-to-see regions of an image, and the high dynamic range preserves critical detail, especially in high contrast scenarios. For added flexibility, the v2640 offers up to 4 modes – Standard Mode, with Correlated Double Sampling for the clearest image, High Speed (HS) Mode, for up to 34% more throughput, and the monochrome cameras also offer binning in both Standard and High Speed modes for a significant increase in sensitivity and throughput. Wayne, NJ, January 31, 2017 – Vision Research, a leading manufacturer of digital high-speed imaging systems, has introduced the Phantom® v2640, the fastest 4-Megapixel (MPx) camera available. It features a new proprietary 4-Megapixel (Mpx) CMOS image sensor (2048 x 1952) that delivers unprecedented image quality at up to 26 Gpx/sec, while reaching 6,600 frames per second (fps) at full 2048 x 1952 resolution, and 11,750 fps at 1920 x 1080. Previous PostRemovu K1 All in One Stabilizer Sports Slow Motion!Next PostGH5s Slow Motion Quality is Inferior to GH5! Impressive footage, I would like to rent one for my clips but even that will be financially not possible for me. CP+ is around the corner but there are more camera’s in line waiting for an upgrade that are not specifically designed for slow motion. We expect impressive things from Sony this year, fingers crossed!